• Know your resume inside and out, line item by line item. Know your cover letter too. Be prepared to explain each item. • Call ahead the day before the interview to confirm your appointment. • Know the exact address of where you are going. Know the directions of how to get there and how long it takes (including traffic time). • Know everything you can about the person you are interviewing with (their name, job title, responsibilities, needs, history with the company, anything you might have in common with them like previous workplaces, alma maters, etc.). • Find out where they are in the hiring process. • Think like a consultant when preparing for an interview, so you can present your true value and worth. • Try to think ahead to the interview. If there is a possibility you will be required to perform a task, be prepared. For instance, if you are applying for a job as a welder, you may be asked to demonstrate your skills on the spot. Have your work clothes and tools available at the interview. • Research to be more informed about the general job market and the job market of the industry for which you are applying. • Look up company information on their website and find out about the company and its industry and the backgrounds of executives. Check them out on Yahoo Finance. Look up their most recent news, general industry trends and their place within those trends, industry ranking, products, customer base, and basic financial information. A few hours of research prior to an interview is worth landing a job that can turn into a career! If possible, you can bring up this information during the interview to impress the hiring managers. • Figure out how you can tie your past experiences to job, particularly in terms of what the company is doing. • Research challenges the company or department faces so you can discuss how you can help tackle them. • Know who your competition is, then figure out where you fit in and how you can bring value to the company to outshine and outlast the competition. 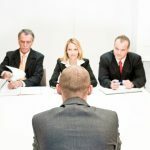 • Know difficult interview questions and possible answers before starting to interview. • Make a list of questions to ask during the interview. • Know the interviewing skills you possess that make you stand out. Capitalize on these during the interview. • Be sure to have rehearsed, so that your comfort level is high. • Print and take extra resumes with you.